Kim, your book is transformative. You address all my concerns that have never been discussed in the many leadership development books I have read. 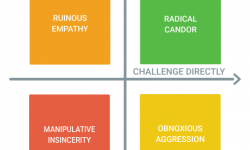 I am in the beginning stages of rolling our Radical Candor to my team & gave my boss a copy of the book as well. I enjoyed your book. It helps managers understand why they need to help people move forward in their positions and provides tips and examples to make it happen. It clarifies why doing nothing is bad for the employee, the manager and the company. You state above “Put up the printouts in conference rooms…”. Are there specific PDF printouts available somewhere on the website or are you suggesting to copy the 2×2 grid graphic from this page to print out and post up? I am not sure that this is the correct forum for this comment, but I did want to point out an area that I felt would have added clarity to me, or perhaps I am missing a point. 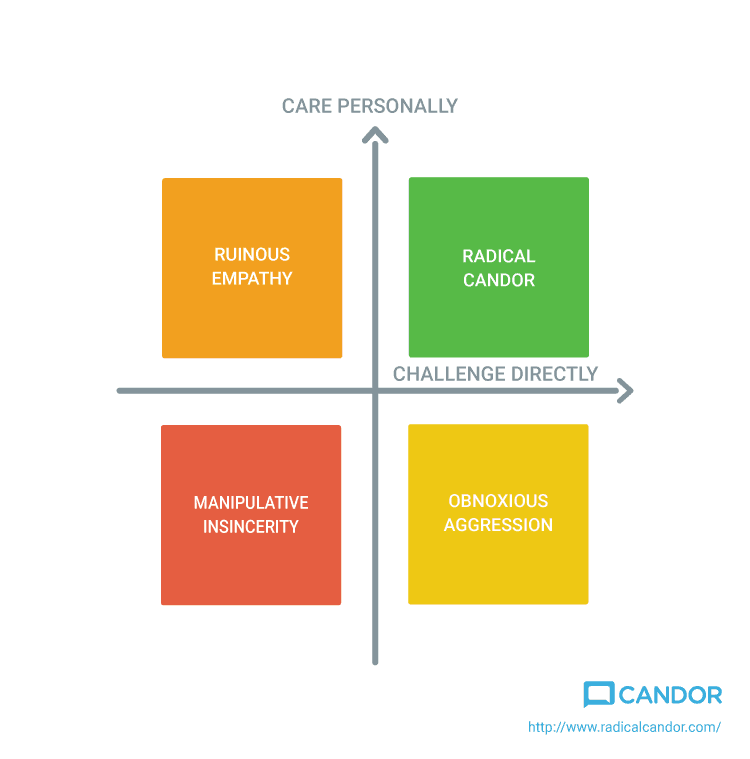 In the graphical depiction of the Radical Candor Framework, I see a mathematical graph with two axes and only the positive sides of those axes are labelled. I would find it helpful to have have labels for the neagative sides of those axes so that in conversations there would be shared verbiage describing those sides of the axes, which we want to help ourselves and others avoid. Perhaps it was not intended as a mathematical construct, but I see both axes as a spectrum and having the negative sides labelled would help with conversations that I have had about the framework. 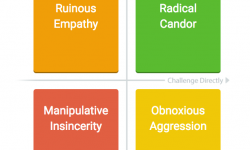 previous post: A Big Change for Candor, Inc.